Some poster-children of the trend include the anti-parasitic drug pyrimethamine (Daraprim) which is essential to treat certain infections in immunosuppressed people and whose price per tablet increased from $13.50 to $750 overnight; the EpiPen injector system used to administer epinephrine to people entering anaphylactic shock; insulin for diabetes; Plaquenil, and more recently Suboxone, the drug used to help manage opioid addiction. As I will show below, there are many more drugs with recently inflated prices still cruising below the radar! The pricing of pharmaceutical products has until recently been hidden from patients, professionals, and public officials alike. Given growing pushback by consumers and their advocates, even legislators and lobbyists are today less able to protect their industry friends. For example, CMS– the federal agency that administers Medicare– has just published a single database encompassing all Medicare outpatient drugs prescribed in its programs from 2011 through 2015. Its newest and most noteworthy feature is that it addresses total cost paid by insurers and patients for virtually every such drug used from 2011 through 2015. It also provides an average total annual spending per user, a practical and understandable number from where the rubber hits the road. Because many drugs come in multiple dosages or physical forms, Medicare usefully provides an average weighted cost-per-unit. Because “units” can be pills, milligrams, milliliters, vials or the like; cost-per-unit is not the same thing as the cost-per-prescription. However comparing the uniformly determined average cost-per-unit over sequential years allows justifiable comparisons to be made. Recall that these are costs/prices paid through the Medicare program. Prices in your local pharmacy may differ greatly and are likely much higher– or at least should be if Medicare is really working for us. Medicare itself calculates the percent unit-price increase for only the single year from 2014 to 2015. I will present some of this data below. Since yearly price increases were highly variable for a given drug, and to provide a better handle on longer-term trends, I calculated the overall increase in cost-per-unit over the entire interval from 2011 to 2015. In summary, of the 4209 drug entries in the database for which data were available for both 2011 and 2015, fully 447 (10.6%) had their prices increase by 100% or more. [Recall that a 100% increase means the price doubled.] 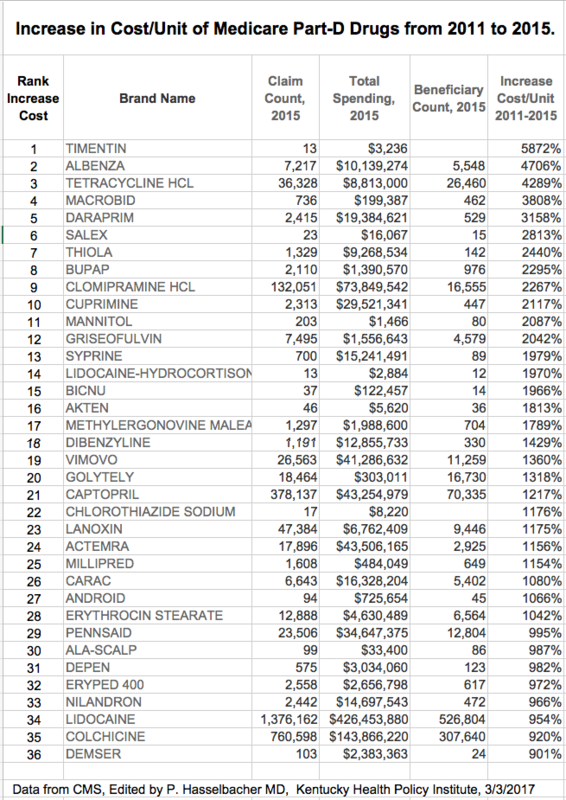 Impressively, prices tripled for 236 drugs, and 175 saw their prices quadruple. Astonishingly, the cost-per-unit prices of 36 drugs increased tenfold or more between 2011 and 2015. The bad-boy drug Daraprim was only number five on this list! There is no doubt I was unable to identify all drugs with major-league markups. For example, my calculation would have missed any drug entering the Medicare market after 2011 or withdrawn before 2015. Additionally, because of confidentiality protections for beneficiaries, Medicare suppresses information about drugs used infrequently, and in this table perhaps for other reasons. No doubt there are complexities within the data set I need to understand better. Below is a simplified list of the “Ten-folders” in descending rank order. I make available a curated expanded list elsewhere. I confess that I have not even heard of many of these drugs, but several things jump right out at me. For example, eight of the 36 drugs whose prices increased tenfold were dispensed in their generic form, and some were only available as generics. An Excel file with additional information on these 36 is available here. An extensive interactive Table containing all drugs in the database is available here. The second tab in the interactive view can be sorted on all columns. Lanoxin is a brand name for generic digoxin. Its price went up more than tenfold and cost some 9446 patients $6.8 million. I cannot conceive of why the protectors of the public purse would pay for this brand-name when a safe and effective generic form is available. [This same question can be asked hundreds of times for items in this database. I will structure a report in this regard in a future article.] Sadly, and for comparison, even ancient generic digoxin had its cost rise more than five-fold and was prescribed to 792 thousand patients at a cost in 2015 of $177.4 million! Clearly no one has been watching the store. This and other observations prompt me to ask the question, What are the pharmacy benefit managers who act as our intermediates with the pharmaceutical industry doing to earn their keep– or are they with their kickbacks and rebates and insurance company partnerships part of the problem? In fairness, over the five years, there were more drugs whose cost-per-unit decreased than increased. That is a project for another day. In the “unbelievable” category is a 1318% increase in the cost of Golightly, one of many oral laxatives that people take before colonoscopy to clear out their entire bowel. (Been there– not fun!) Golightly is an uncomplicated branded solution of polyethylene glycol and salts whose ingredients must cost pennies to make. In 2015 it was only used by some 16.7 thousand Medicare beneficiaries, so I assume a different laxative was used, but why pay more? Recall that Medicare encourages and pays for screening colonoscopies to detect early colon cancer. This is a gravy-train for the folks pushing this particular method of screening for colon cancer. Why so many drugs for arthritis on the short list? As a former rheumatologist, I was disappointed to see several my old drugs in these lists. In fact, Cupramine and Depen (both brands of penicillamine) are in the high-roller list. This drug was available to me in the 1970s to treat rheumatoid arthritis, but I never found it to be very effective. Given that newer highly effective drugs have become available, I’m surprised if it is being used at all for arthritis. However, because it chelates (binds with) metals, it is also used for inherited disease. For example, people with rare Wilson’s disease accumulate too much copper in their systems and can benefit. This is a relatively old drug. Who wants to justify these jacked-up prices for people who need it to survive or postpone their liver transplants? While we are still on the topic of arthritis drugs, I was not surprised to see colchicine on this list. Colchicine was one of the first drugs whose generic form was hijacked and its prices increased– outrageously so. Colchicine was used by Hippocrates– probably as a purgative to cause diarrhea– but was adopted for the treatment of acute gout. There are more effective drugs to treat acute gout, but in parallel with the increase in price came a marketing blitz for a drug that I had never before seen advertised! The same thing happened with the generic cancer drug methotrexate, the first drug in my experience that did not require a statistician to demonstrate that it was also effective for rheumatoid arthritis. The generic form was pulled from the market, branded and repackaged by the same manufacturer, and the price increased to whatever the maker thought the market would bear– which was more than many/most people could afford. We rheumatologists should be ashamed of ourselves. I am one of those. By not giving more pushback at the time, we betrayed the interests of our patients. I hope it is only a coincidence that across all the medical specialties, rheumatologists receive among the highest individual payments from Medicare– largely for the medicines administered in the office. Just as we physicians stood by as the marketers of opioids distorted the practice of medicine, so have we allowed the pharmaceutical and medical device industries unjustifiable control over both the cost and practice of medicine more broadly. We have an obligation to our patients to fully engage in a reboot that will allow efficient and affordable medical care for those who need it. The five-year increases highlighted in this article were calculated by me for those drugs whose prices were available in both 2011 and 2015. Medicare itself only included the single-year change between 2014 and 2015 in this database. Thirty-two drugs more than doubled in cost in this single year, all the way up to a six-fold increase for the antihypertension drug, Cozaar. [Yes, a generic form, losartin, is also available.] Sadly, old-fashioned antibiotics; generic and “me-too” nonsteroidal anti-inflammatory drugs; and even long-established generic medicines for hypertension and heart failure are in this acutely and highly jacked-up list of drugs. A glance at the numbers reveals that some of these individual drugs were given to upwards of a million patients in 2015, at a total spending cost of nearly $400 million, and up to $40,000 of total annual spending per user. I don’t know whether to be angry or to cry. How you feel about it? How should we feel about it? Is this the free market system at work, or the free market run amok? I prefer not being run over. Enough for now. I will be mining this newest database in other ways. I am sure there is a background story for the costs of most of the drugs on these lists that is known to those of you with more specific expertise. Please share what you know in the public comments section below. Who knows, perhaps there are some reasonable justifications for what otherwise might pass for extortion of the vulnerable. Recall also that conclusions are only as valid as the information in the database. If you have more to say that you would like to contribute as a full article, please consider contacting me privately with ph @khpi,org. Here is an Excel file of all drugs in the list that can be sorted, etc.. For many, no data was provided. Let me know if the interactive online version, the Excel files, or other links do not work. Next Next post: Should Kentucky Physician Assistants Prescribe Controlled Substances?